Among the many Renaissance composers whose music has lain undiscovered for so long, Pierre de Manchicourt (c1510–1564) is one of the most surprising omissions from the canon of great names. 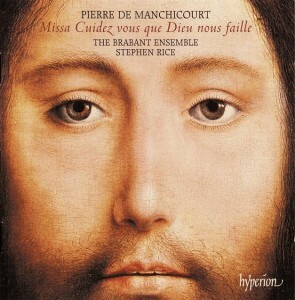 Whereas certain of his contemporaries have attracted criticism from music historians for their rich textures, which are perceived as unvaried and consequently difficult listening, Manchicourt’s music—as this CD hopes to demonstrate—is much more approachable, yet retains a creative approach to harmony and melodic invention. The programme presented here explores his religious music, taking in a parody Mass (of which he wrote nearly twenty), several motets for varying voice combinations, and his only Magnificat setting. Manchicourt was also active as a composer of French chansons, of which over fifty survive. The generally accepted birth date of the composer is c1510, based on a statement that he was a chorister at the cathedral of Arras in 1525. Since this rests on an uncorroborated assertion by a modern writer, however, it may be that Manchicourt was somewhat older than this. He was certainly born in Béthune in Northern France, as the title page of his motet collection published in 1545 states. For most of his career Manchicourt operated within the vicinity of his birthplace, holding positions at Tours, Tournai, and Arras. Finally, in 1560, he was recruited to head the chapel of Philip II of Spain, dying in Madrid on 5 October 1564. He was considered among the great composers by writers such as Rabelais (1552) and the chronicler Lodovico Guicciardini (1567). Manchicourt’s setting of Peccantem me quotidie, for four voices, is distinguished by its expressive use of homophony, a somewhat infrequent technique in the 1530s. The piece begins with a chordal statement of the opening line, ‘Sinning every day’, before reverting to Manchicourt’s more usual imitative writing. Extensive rising lines at ‘nulla est redemptio’ (‘there is no redemption’) build towards the climactic phrase ‘Miserere mei, Domine’ (‘Have mercy on me, Lord’), which is again homophonic, and set apart from the preceding line by a general pause. Manchicourt set the words of the Magnificat canticle only once, presumably early in his career since it was published in 1534. Like almost all of his contemporaries, Manchicourt set half of the verses of the canticle polyphonically, the others being performed in chant. (The exception was Cristóbal de Morales (c1500–1553), who as a member of the Sistine Chapel choir followed local practice by setting all the verses in his Magnificat cycle.) Certainly the musical style of the polyphonic verses suggests an early date: their four-part texture is rather spare, in the manner of Richafort or other composers a generation older than Manchicourt is believed to be. Partly this is due to the heavy reliance on the second tone plainchant melody, which can be clearly heard in the first polyphonic verse at ‘in Deo salutari meo’ (‘in God my saviour’), where first tenors and basses, and then sopranos and altos, each have a string of repeated notes which mirror the recitation tone of the chant. Later in the canticle, reduced-voice sections create variety, with a low-voice trio for ‘Fecit potentiam’ (‘He hath showed strength’) and a soprano and alto duet at ‘Esurientes implevit bonis’ (‘He hath filled the hungry with good things’). Finally, the last two polyphonic verses are expanded to a five-voice texture by the addition of a second alto, Manchicourt heightening the effect of the ‘Gloria Patri’ with stretto imitative writing.